Groomers from across the region are set to receive training to spot the warning signs of mental health problems in their customers, along with best practice guidance on how to listen, give helpful advice, and signpost to support services. Launching on International Men’s Day (Monday 19th November), the initiative aims to raise awareness of the avoidable tragedy of male suicide, which is the biggest killer of men under 45 in North Wales, and across the UK. Statistics show that men are three times as likely to take their own lives as women, with men accounting for 75% of all suicides in the UK. The training drive is being supported by NHS Charity, Awyr Las’ I CAN mental health campaign and led by Local Implementation Teams which include representatives from Betsi Cadwaladr University Health Board, local authorities and mental health charities, who are working together to implement North Wales’ first integrated mental health strategy. 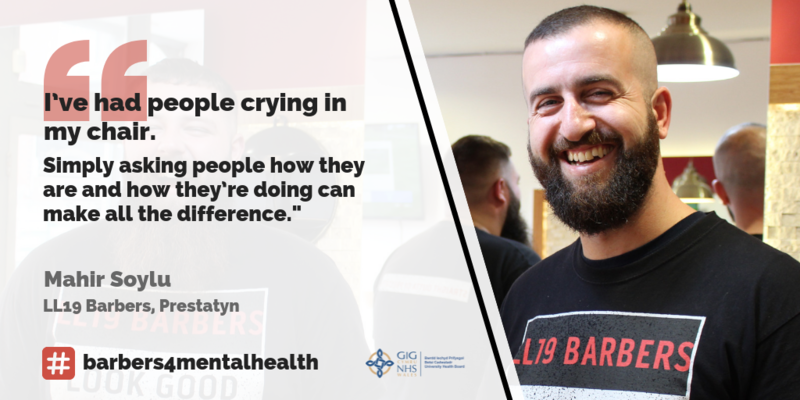 It’s a cause that is close to the heart of Denbighshire barber, Mahir Soylu, who says that barber shops have an important role to play in supporting men who are struggling with their mental health. Since opening LL19 Barbers in Prestatyn two years ago, the 31 year old has used his own experience of suffering with stress, anxiety and low self-esteem to help others. He said: “Barber shops provide that safe space for men to open up about how they’re feeling. “We’re not close enough to our customers to know what is going on in their lives, but we work in close proximity to them for 15 minutes and we are literally touching them. That breaks down a barrier and brings more openness. “I’ve had people crying in my chair. Simply asking people how they are and how they’re doing can make all the difference. I don’t often have the answers but I know I can make an impact by just listening. 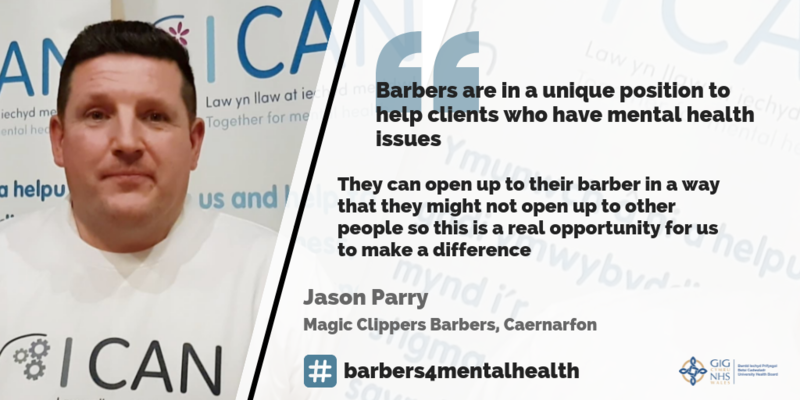 The training has also received the backing of Jason Parry from Caernarfon, who runs the Magic Clippers Barbers. Sam Watson, Betsi Cadwaladr University Health Board’s Head of Mental Health Service for North West Wales, said the training drive would complement work that is taking place across the region to improve mental health support. She said: “There have been a number of successful initiatives to encourage people to talk about their mental health, but it’s also vital that people have the skills to listen effectively and provide helpful advice. “We’re working hard to improve the mental health services we provide, but we also recognise the crucial role that people in communities across North Wales can play in supporting each other. The training programme is set to be rolled out more widely next year and Betsi Cadwaladr University Health Board are encouraging anybody interested in getting involved to register an interest by contacting them at bcu.info@wales.nhs.uk. The free and confidential C.A.L.L Mental Health Helpline is available 24/7 to provide emotional support and signposting to local services. Call 0800 132 737, text ‘Help’ to 81066, or visit www.callhelpline.org.uk. Click here further information on #TODAYICAN – Betsi Cadwaladr University Health Board’s new campaign to save and free up 1,000 hours of staff and patient time each day through 1,000 stories of change across its Mental Health & Learning Disabilities Division.